If you are like me, you love to watch new movies. I recently watched a film that I can highly recommend. It’s called The Intern, and it was written, produced and directed by Academy Award nominee Nancy Meyers (she was nominated for Best Original Screenplay in Private Benjamin in 1980). The Intern featured many of my favorite Hollywood actors, and it also had a great screenplay. 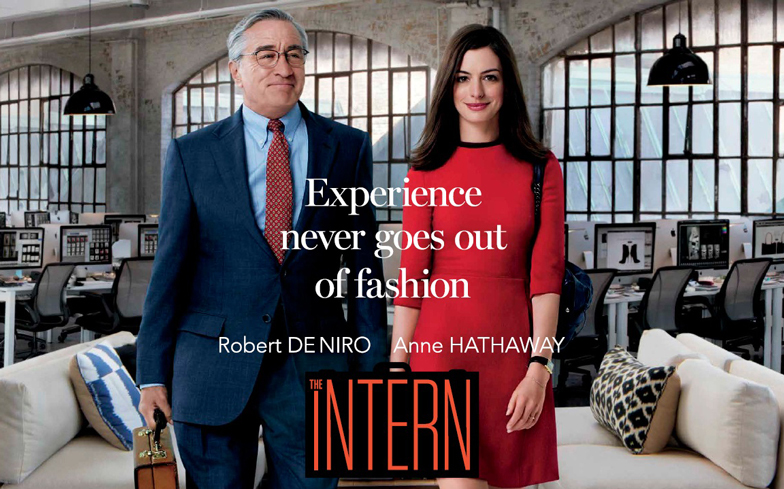 The Intern tells the story of Ben Whittaker, played by two-time Academy Award winner Robert De Niro (Best Actor in a Supporting Role for The Godfather: Part II in 1974; Best Actor in a Leading Role for Raging Bull in 1980), a 70-year old retiree and widower who has discovered that retirement isn’t all it’s cracked up to be. After seeing a job advertisement that showed a sign for “senior” interns, Ben decided to apply. The internship was at a successful internet fashion site, founded and run by founder Jules Ostin, played by Academy Award winner Anne Hathaway (Best Supporting Actress for Les Misérables in 2012). Seizing an opportunity to get back in the game, Ben becomes a senior intern at the online clothing retailing company, which has over 200 employees. Jules Ostin is much younger than Ben, and of course she was originally skeptical of the senior internship program; when Ben was hired, she did not really seem to trust him. But there were questions about Jules too: was there something in her private life she wanted to hide, or did she just fear scrutiny? Ben, even though he was older, still had a lot to offer her company, but also to Jules herself: he became a guardian angel, a so-called Fairy Godfather, and a loyal companion. She gradually realized she needed a wise, warm employee, and like magic, Ben was there. I have watched many of the films that were directed by Nancy Meyers. As a great fan of her work, I expected this film to be a fun, neat comedy, but what I found was so much more: The Intern had a great plot, brilliantly executed and acted. In fact, it was just the sweetest, most perfect and heartwarming film I have ever watched. The entire cast had a very strong chemistry between them– both Hathaway and DeNiro were especially wonderful. Robert De Niro played the perfect gentleman, the kind that every female in the audience can fall in love with. Anne Hathaway played the role of a successful entrepreneur who loves her job, but still feels guilty about being a working wife and mom with an unemployed husband at home taking care of her infant daughter. Both of these Oscar-winning actors gave genuine, warm performances. It was so good to see De Niro in a low-key and gentle role. He is so immensely likable, but totally credible, even though he seems a little too good to be true sometimes. This film about the life of a woman executive worked much better than director Meyers’ previous three films [It’s Complicated (2009), Something’s Gotta Give (2003) and The Holiday (2006)]. The Intern felt more complete and less contrived. I found The Intern very entertaining: it was such a heartwarming movie, and I walked out of the movie theater with a big smile and good memories.